It is time for the final set of time trials of our Winter training and I would like you to focus on swimming them with a good mindset. Most of you are in very good shape physically, and have improved your technique over the Winter, so the other key aspect to putting in a good performance is having a good mindset. Helen is much more on an expter on this than me and her advice for you all is that a good mindset to adopt is a Challenge mindset. 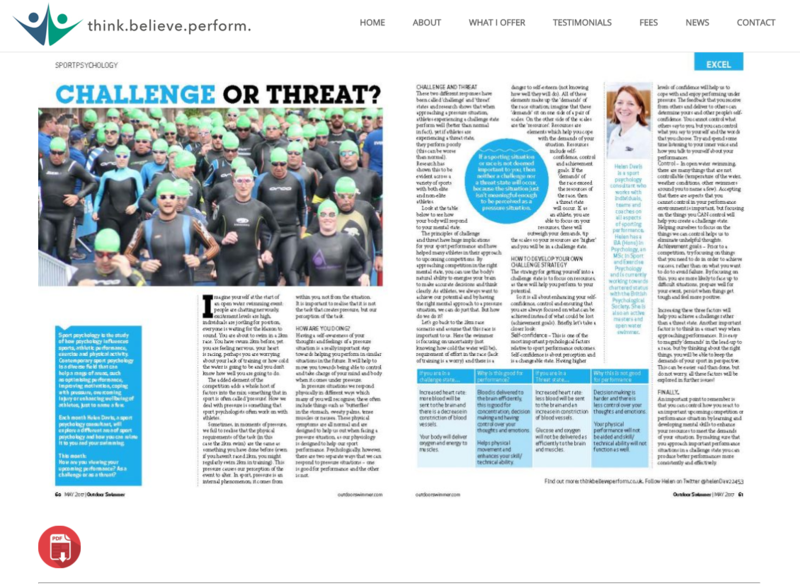 She has written an excellent article for Outdoor Swimmer Magazine on this very topic which you can read here. Self-confidence – many of you are great at encouraging others during time trials but speak less encouragingly to yourselves. How about trying to speak to yourself in the same positive way as you would to encourage others by focusing on all the good sessions you have done in preparation? Control – you can’t control how anyone else swims in the lane next to you, so how about focusing on what you can control with your effort and technique, especially if you know that good technique helps you swim quicker. For the last time trial I know some of you tried this (thinking on just one aspect of technique each length) and found it very successful. Achievement goals – focusing on a good achievement goal, like relaxing on the first 100m or saving enough energy to start pushing the 3rd 100m, are much better than worrying about what others might be thinking or what your time will be. Focusing on how you want to swim the time trial will allow the result to look after itself. So what are the 3 things you will do for self-confidence, control & acheivement goals to try and give yourself a good challenge mindset this week?